I’m adjusting to the Alkyd Fast drying oil colours. The changeover from standard oils was gradual with a phase where I was using Alkyd as an under layer and finishing the painting in standard oils. Now its Alkyd only. At one point I thought they were only useful as an under layer as the luminosity of the lighter coloured mixes were not as intense as standard oils. This painting and the next (just completed) are exercises in vivid colour, contrast, glowing highlights, and rich shadows. My initial thoughts about lack of strength in the colours was probably due to the fast drying. By the time the painting was finished in about 2 hours the paint was already beginning to dry and the usual dulling of the colours was already happening. I’ve ‘oiled out’ the recent paintings and wow they’re sparkling. Here is the painting video. See you soon. 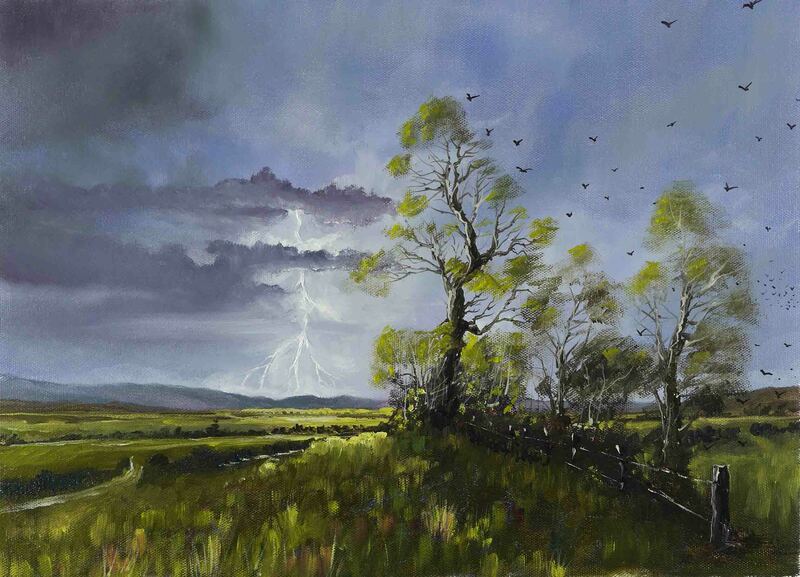 This entry was posted in Oil Painting and tagged Alkyd, Art, Birds, Culture, Education, Inspiration, Irish landscape, Lightning, Medium, Oil Painting, Oil Painting Instruction, Oil Painting Landscape, painting, Pictures, Spring, Thunder, Time lapse painting, Trees. Bookmark the permalink. I can understand why. Alkyd are tricky to come to terms with. I am probably not the best person to advise you on building a portfolio. I try not to be influenced by what is happening in the ‘art world’. We each have a path to follow and being successful is finding your particular path. Unfortunately, this is not always what is currently in fashion. Liquin and Alkyd are the same medium. They are new forms of traditional oil painting technique. If you are following my blog you will know my thoughts and concerns about how we use these untried materials. Liquin and oils are compatible but only if used in a particular way. Basically, Liquin should not be glazed over standard oil colours, because it seals off the drying of the oils. So underpainting with Alkyd or Liquin is OK. Overpainting standard oils is not. I understand I hate current trends in art as well. Thank you for the advice. I usually try to not use much of the ‘thinner’ liquids because they have a strange, watery texture, but that rule would make using them more effective.